Each volume of Light of the Dhamma contains 2-4 PDF issues and download sizes vary. Click orange titles below to download issues. 1956 represented the 2,500th anniversary of the teachings of the Buddha. To commemorate this event and to reinvigorate the Sasana (the teaching of the Buddha), a recitation of the entire Tipitaka (the written documentation of the entire collection of the Buddha s teachings) was held in Rangoon, Burma (later renamed Yangon, Myanmar). Twenty five hundred bhikkhus from Burma, Sri Lanka, Thailand, Laos, and Cambodia participated in the recitation, which spanned several years. Lay attendees from over 30 countries attended various portions of the council. It is a popular belief among Theravada Buddhists that the Buddha s teaching is destined to last for 5,000 years following his lifetime. Additionally, this belief holds that the second half of this Sasana will see a strong resurgence of the spread of the Dhamma throughout the World. In light of this event, a publishing organization was formed in Burma to help the spread of these teachings. It was formed in Rangoon and called The Union of Burma Buddha Sasana Council. 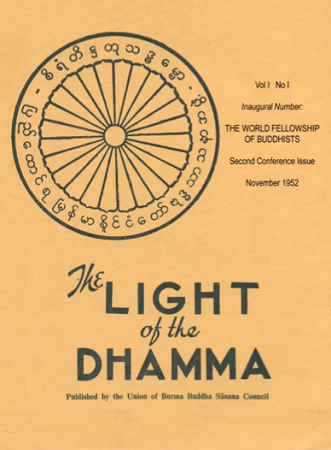 This organization began publishing the The Light of the Dhamma in October, 1952 and continued to publish the magazine in fairly consistent quarterly installments until mid-1963. Each issue of this magazine contained a wide selection of articles submitted to the editors. Among the notable writers whose works were found in its pages are many Venerable Mahatheras, as well as lay writers. Topics of these articles included updates on the Council s recitation, various aspects of the Buddha s teachings, and practical application of these teachings in day-to-day life. The accompanying electronic texts represent an exhaustive effort to re-publish these works. These texts are now mostly 50 years old and in various stages of decay. The original texts were first copied to avoid damaging the originals and to minimize the bleed-through effect of the aging pages. The copies were then scanned using Optical Character Recognition technology which captured the majority of the Roman script, English characters. The texts were then analyzed word by word for proper translation, including the insertion of the appropriate diacritical marks for Pali words found in the original texts. All pictures and tables were then scanned in and placed appropriately to accurately represent the original formatting. Lastly, they were converted to pdf formats, proofread again and then uploaded to this site. The expressed intent of the original publishers of this magazine was to propagate the teaching of the Buddha with no monetary remuneration involved. These publishing entities and their editorial boards have long-ago dissolved. These works were originally published with no copyrights, and we believe that they would approve and endorse these measures that we have taken to preserve their monumental efforts. The objective of Pariyatti in making these works much more widely available through digital media is a continuation of those efforts to spread the teaching of the Buddha and to propagate the Sasana.